Companies that don’t have a Twitter strategy and a lead-generation plan are missing out on a huge opportunity. Twitter, which has more than 200 million active users, is a vibrant community where businesses can interact with leads and industry thought leaders to discuss hot topics and trends. A recent study published by Mediabistro’s All Twitter found that 82 percent of leads generated through social media are referred from Twitter. They also found that Twitter outperforms LinkedIn and Facebook nine to one for lead generation. The beauty of Twitter is its real-time engagement, and because of the wide reach and the nature of the Twitter news feed, it gives businesses a great forum to get the word out to potential customers so they can discover and learn more about your company. You can also have real-time conversations with your followers, which is a great opportunity for relationship-building. B2C companies do a great job at this, and B2B companies are quickly catching on. As an example, say there’s a heat wave going on. Coca-Cola might tweet about the heat, a follower could tweet back that he is beating the heat with a nice cold bottle of Coca-Cola, and then Coca-Cola tweets back with a coupon code and a thank-you. It is critical to follow the 4-1-1 rule when it comes to Twitter. There is so much going on that that you need to post often; however, you can’t be constantly posting your own stuff. (No one likes a narcissist, even in the online world.) Make sure you diversify your presence. Like Facebook, Twitter also offers opportunities for lead generation by both using their paid options and by simply adding links to your tweets. 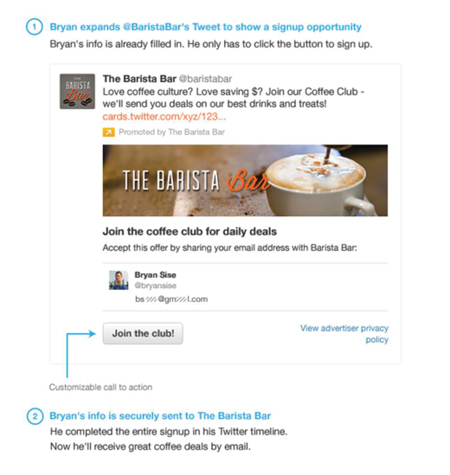 Twitter Lead Generation Cards enable marketers to collect lead information directly from Twitter. A user can fill out his information quickly and securely and never leave Twitter — which is a huge plus for many users. How do these handy Lead Generation Cards work? When someone expands your tweet, they can see the description of your offer and a strong call-to-action (CTA). The easy part is that the Twitter handle, name, and email address fields are already prepopulated with their information, so they don’t have to do very much. Twitter Lead Generation Cards also have the ability to sync with a marketing automation tool, so that you can keep your lead information all in one place. However, note that the Lead Generation Cards only have a single full name field, and most marketing automation platforms collect names in separate first and last name fields. Twitter Lead Generation Cards also do not capture company data. Because of this difference, you cannot at this time push leads from your marketing automation tool to your CRM tool for sales follow-up. However, you can add them manually or upload a list. The following figure shows an example Twitter Lead Generation Card. As you can see, there is a compelling image, a clear message, and a CTA. Note how Twitter prepopulates the user’s information. But don’t stop after someone fills out your card. Make sure to send a follow-up email to ensure that the lead has taken the correct action — that is, downloaded your ebook, for example. And as extra insurance, add the offer link in your email, just in case they didn’t.